Pippa is the shop dog at both Mill Creek Framing and Maven & Grace. The 6-year-old (her birthday is on April 27) Australian Labradoodle, Pippa, was recruited to be part of the store team at just 12 weeks old. Her human and the owner of the shops, Kathy Sharp, brought home puppy Pippa just before they purchased the framing shop. From day one, Kathy knew Pippa would be coming to work. 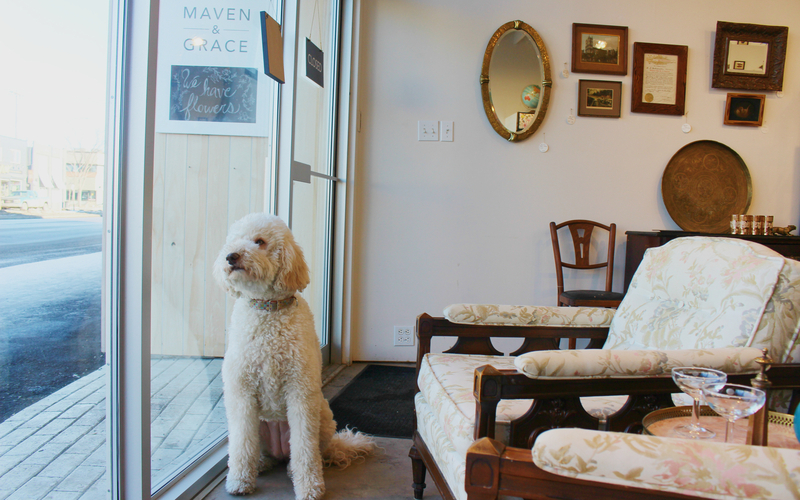 When Maven & Grace opened in 2015, Pippa decided to split her time between the sister stores. Pippa's got a fancy name. In Australia, it's short for Philippa, and her family always thought it was a cool name, but alas their third non-fur baby was a boy and it didn't suit him! Tilda was also high on the list, but when they met her, she definitely felt like more of a Pippa. Pippa's birth name was Angel Food Slice, and she has a identical twin brother.